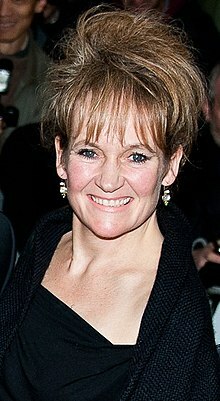 Lorraine Ashbourne (born 1961) is an English stage, film and television actress. Ashbourne has appeared on British series and television films, including: The Street, True Dare Kiss, Thin Ice, In a Land of Plenty, Boon, Playing the Field, City Central, Peak Practice, The Bill, Pie in the Sky, Casualty, In Suspicious Circumstances, Mr Wroe's Virgins, Rich Tea and Sympathy, and London's Burning. She narrated Happy Birthday BBC Two in 2004. As a stage actress, Lorraine regularly appeared at the Royal Exchange Theatre in Manchester, playing roles such as Kate Hardcastle in She Stoops to Conquer and as Emilia in Othello both of which she acted alongside husband Andy Serkis. She has been married to actor Andy Serkis since 22 July 2002; they have 3 children, Ruby (b. 1998), Sonny (b. 2000) and actor Louis Ashbourne Serkis (b. 2004). The family resides in Crouch End, London. 1987 The Bill Tracy "Brownie Points"
1987 Casualty Sandy "Cry for Help"
1988 London's Burning Sue "1.2"
1989 Boon Judy "Big Game Hunt"
1990 The Bill Maria "Something Special"
1993 Mr. Wroe's Virgins Anne "Leah's Story"
1994 The Bill Jenny Longden "He Who Waits"
1994 In Suspicious Circumstances Ann Bailey "Absence of Mercy"
1994 Casualty Teresa England "Relations"
1994 Three Seven Eleven Sylvia Powers "2.2", "2.3"
1995 Pie in the Sky Maeve Cormack "The Mild Bunch"
1995 Chiller Susan Taylor "Number Six"
1995 Peak Practice Tina Greaves "Life and Soul", "Other Lives"
1996 The Bill Shirley Briggs "Too Close for Comfort"
2002 Clocking Off Sally Preston "Alan's Story"
2003 The Eustace Bros. Anna Goodman "1.3"
2007 The Street Cath Hanley "Demolition", "Taxi"
2009 Lark Rise to Candleford Lilly Spicer "2.3"
2009 Law & Order: UK Maureen Walters "Care"
2010 Moving On Treena "I am Darleen Fyles"
2010 Thorne Ruth Brigstocke "Sleepyhead", "Scaredycat"
2010 Little Crackers Miss Meadowcroft "Victoria Wood's Little Cracker: The Giddy Kipper"
2011 Coming Up Linda "Rough Skin"
2012 New Tricks Moira Wright "Body of Evidence"
2012 The Syndicate June Juniper "1.3"
2014 Silent Witness DI Rachel Klein "Coup De Grace: Parts 1 & 2"
2015 Inside No. 9 Carol "Nana's Party"
2015 New Tricks Vicky Collins "The Crazy Gang"
2017 Grantchester Cora Maguire "3.5"
2018 Midsomer Murders Daniella Bellini "Send in the Clowns"
^ Murray, Braham (2007). The Worst It Can Be Is a Disaster. London: Methuen Drama. ISBN 978-0-7136-8490-2. Wikimedia Commons has media related to Lorraine Ashbourne. This page was last edited on 11 March 2019, at 00:52 (UTC).